This step is not always necessary, so first check with whoever wants your document. Have been notarised by a Notary Public, and certain other documents, which are then certified by a conformant apostille. It is no longer possible to personally take documents to Milton Keynes and wait while the apostille is attached. Consular legalisation fees vary depending on the country concerned. The UK Government E-Register of Apostilles is now live. Through this Register anyone with the date of issue and the offical number of an Apostille can check a document’s authenticity. Where the name of a country appears in capital letters, the Hague Convention of 5th October 1961 is in force there. Angola Consular legalisation required. Documents not in Portuguese must be submitted with a translation. ANGUILLA Legalisation of the acts of an English or Welsh notary public unnecessary in most cases. ANTIGUA & BARBUDA Legalisation of the acts of an English or Welsh notary public unnecessary in most cases. AUSTRALIA Legalisation of the acts of an English or Welsh notary public unnecessary in most cases. BAHAMAS Legalisation of the acts of an English or Welsh notary public unnecessary in most cases. Bahrain Apostille + Consular legalisation required. BARBADOS Legalisation of the acts of an English or Welsh notary public unnecessary in most cases. BERMUDA Legalisation of the acts of an English or Welsh notary public unnecessary in most cases. Bolivia Apostille + Consular legalisation required. BOTSWANA Legalisation of the acts of an English or Welsh notary public unnecessary in most cases. BRUNEI DARUSSALAM Legalisation of the acts of an English or Welsh notary public unnecessary in most cases. Burkina Faso Consular legalisation required. Canada Legalisation of the acts of an English or Welsh notary public unnecessary in most cases. Cape Verde Consular legalisation required. CAYMAN ISLANDS Legalisation of the acts of an English or Welsh notary public unnecessary in most cases. Central African Republic Consular legalisation required. CHANNEL ISLANDS Legalisation of the acts of an English or Welsh notary public unnecessary in most cases. China Apostille + Consular legalisation required. Congo, Republic of the Consular legalisation required. Costa Rica Consular legalisation required. Cote d’Ivoire Consular legalisation required. Cuba Consular legalisation required. 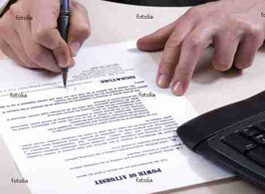 Documents not in the Spanish language must be accompanied by a notarised translation into Spanish. Cyprus (North) Legalisation by North Cyprus representative office required. Democratic People’s Republic of Korea Consular legalisation required. Democratic Republic of the Congo Consular legalisation required. DENMARK Legalisation of the acts of an English or Welsh notary public unnecessary in most cases. DOMINICA Legalisation of the acts of an English or Welsh notary public unnecessary in most cases. Egypt Apostille + Consular legalisation required. Equatorial Guinea Consular legalisation required. FALKLAND ISLANDS Legalisation of the acts of an English or Welsh notary public unnecessary in most cases. FIJI Legalisation of the acts of an English or Welsh notary public unnecessary in most cases. The Gambia Legalisation of the acts of an English or Welsh notary public unnecessary in most cases. Ghana Legalisation of the acts of an English or Welsh notary public unnecessary in most cases. GIBRALTAR Legalisation of the acts of an English or Welsh notary public unnecessary in most cases. GRENADA Legalisation of the acts of an English or Welsh notary public unnecessary in most cases. Guatemala Apostille + Consular legalisation required. The Consulate’s fee is £10 per document. Guyana Legalisaion of the acts of an English or Welsh notary public unnecessary in most cases. Iran, Islamic Republic of Consular legalisation required. IRELAND Legalisaion of the acts of an English or Welsh notary public unnecessary in most cases. Isle of Man: See Man, Isle of Apostille. Jamaica Legalisaion of the acts of an English or Welsh notary public unnecessary in most cases. Kenya Legalisaion of the acts of an English or Welsh notary public unnecessary in most cases. Kiribati Legalisaion of the acts of an English or Welsh notary public unnecessary in most cases. Kuwait Apostille + Consular legalisation required. Lao People’s Democratic Republic (Laos) Consular legalisation required. LESOTHO Legalisaion of the acts of an English or Welsh notary public unnecessary in most cases. Libya Arab Jamahiriya Consular legalisation required. MACEDONIA, THE FORMER YUGOSLAV REPUBLIC OF Apostille. Malaysia Legalisaion of the acts of an English or Welsh notary public unnecessary in most cases. Maldives Legalisaion of the acts of an English or Welsh notary public unnecessary in most cases. MAN, ISLE OF Legalisaion of the acts of an English or Welsh notary public unnecessary in most cases. Micronesia, Federated States of Consular legalisation required. MONTSERRAT Legalisaion of the acts of an English or Welsh notary public unnecessary in most cases. Morocco Apostille + Consular legalisation required. Nauru Legalisation of the acts of an English or Welsh notary public unnecessary in most cases. Nepal Apostille + Consular legalisation required. NEW ZEALAND Legalisation of the acts of an English or Welsh notary public unnecessary in most cases. Nicaragua Apostille + Consular legalisation required. Nigeria Legalisation of the acts of an English or Welsh notary public unnecessary in most cases. Pakistan Apostille + Consular legalisation required. Palestine Legalisation by Palestine General Delegation in London recommended. Papua New Guinea Legalisation of the acts of an English or Welsh notary public unnecessary in most cases. Paraguay Apostille + Consular legalisation required. Philippines Apostille + Consular legalisation required. Pitcairn Island Legalisation of the acts of an English or Welsh notary public unnecessary in most cases. SAINT HELENA Legalisation of the acts of an English or Welsh notary public unnecessary in most cases. SAINT KITTS AND NEVIS Legalisation of the acts of an English or Welsh notary public unnecessary in most cases. SAINT LUVIA Legalisation of the acts of an English or Welsh notary public unnecessary in most cases. SAINT VINCENT AND THE GRENADINES Legalisation of the acts of an English or Welsh notary public unnecessary in most cases. SAMOA(formerly Western Samoa) Legalisation of the acts of an English or Welsh notary public unnecessary in most cases. SAO TOME AND PRINCIPE Apostille. Saudi Arabia Apostille + Consular legalisation required. SEYCHELLES Legalisation of the acts of an English or Welsh notary public unnecessary in most cases. Sierra Leone Legalisation of the acts of an English or Welsh notary public unnecessary in most cases. Singapore Legalisation of the acts of an English or Welsh notary public unnecessary in most cases. Solomon Islands Legalisation of the acts of an English or Welsh notary public unnecessary in most cases. SOUTH AFRICA Legalisation of the acts of an English or Welsh notary public unnecessary in most cases. Sri Lanka Legalisation of hte acts of an English or Welsh notary public unnecessary in most cases. SWAZILAND Legalisation of the acts of an English or Welsh notary public unnecessary in most cases. Syrian Arab Republic Consular legalisation required. Taiwan Legalisation by Taipei Representative Office, London. TONGA Legalisation of the acts of an English or Welsh notary public unnecessary in most cases. TRINIDAD AND TOBAGO Legalisation of the acts of an English or Welsh notary public unnecessary in most cases. TURKS & CAICOS ISLANDS Legalisation of the acts of an English or Welsh notary public unnecessary in most cases. Tuvalu Legalisation of the acts of an English or Welsh notary public unnecessary in most cases. Uganda Legalisation of the acts of an English or Welsh notary public unnecessary in most cases. United Arab Emirates Apostille + Consular legalisation required.The Consulate’s fee for each commercial document is £400. United Republic of Tanzania Legalisation of the acts of an English or Welsh notary public unnecessary in most cases. UNITED STATES OF AMERICA Apostille (not required in all States). VANUATU Legalisation of the acts of an English or Welsh notary public unnecessary in most cases. VENEZUELA, BOLIVARIAN REPUBLIC OF Apostille. VIRGIN ISLANDS – BRITISH Apostille advisable. Zambia Legalisation of the acts of an English or Welsh notary public unnecessary in most cases. Zimbabwe Legalisation of the acts of an English or Welsh notary public unnecessary in most cases. The requirements set out above are intended as a guide only and are not intended to replace advice from practitioners qualified in the relevant jurisdictions. Where consular legalisation is required, the particular requirements of the relevant consulate should be ascertained. 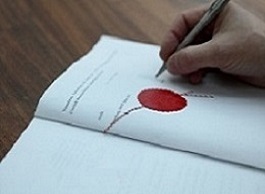 An addition in the margin of a written document or at the bottom of a letter. So an Apostille consisited of an annotation in the margin of a document or at the end of a letter. 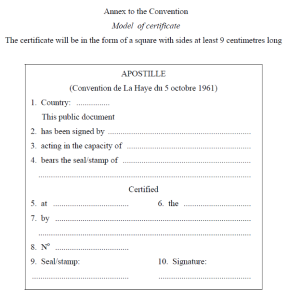 During the negotiations on the Convention, the term “apostille” was preferrred because of its novelty. The other suggestion having been attestation.